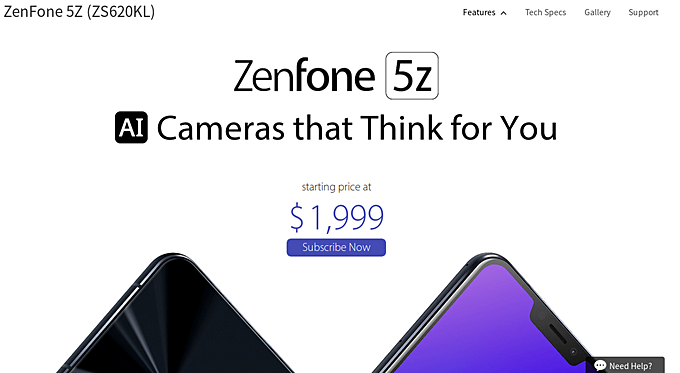 The Asus Zenfone 5z debuted back in February at this year's MWC. The Snapdragon 845-powered phone went on sale this month in Europe andJapan, while India is scheduled to get it next week. Now, listing for the device has gone live on the company's US website as well. While this is good news for fans in the states, the listing says the device starts at $1,999. Yes, a whopping $1,999. For comparison, in Europe, the handset costs around $575. Is the company planning to bring a highly beefed up version of the phone to the US? Well, no, as it's the same model (ZS620KL) with same specs you'll find in other regions. So this is very likely a typo or mistake at Asus' end, and should be rectified soon. Still, we'd imagine the company would treat its flagship with more attention. Hello Friend.. Please pick me one up for $500.00 and ship it to: ( Address To Follow ) and, I'll send you the money to: ( Address Requested ) and that will be great! Asus is tightly government backed. This is a strategy to fight back tax war. The page seems to be work-in-progress, or draft, not final public release. So the $1,999 price is just placeholder, not actual sales price.